In the run-up to our new Hatchery intake, we are catching up with some of the present and past participants of the programme. This week we caught up with Corinne Webb who is the founder of Frame & Cover. Her business provides unique and high-quality furniture upholstered in her own textile designs. Corinne’s passion for her work has resulted immediate success for her company. Originally come from Dorset, Corinne went to Manchester to study Textiles specialising in Weave. After completing her degree and a year’s sojourn in South America she came to London where she found work as a Textile Designer. Corinne worked for a high end textile company called Marvic and from there she went to work for Laura Ashley, gaining insightful industry knowledge and sharpening her design skills along the way. 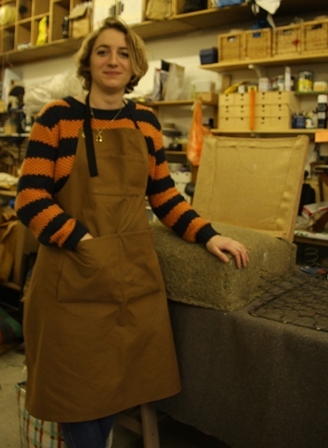 Corrine felt her future was in furniture design and this led her to do a 2 year course in Upholstery at The Cass, part of London Metropolitan University. What is your business? What is the product/service, and who buys it. Frame & Cover produces design led, high quality, bespoke upholstery with a range of unique printed textiles. What sets our new upholstery collection apart from other chair retailers is the fact the chairs are produced using materials that are kind to the environment. Our customers are discerning home owners who have a love for design that don’t compromise on quality. The main reasons for me starting my own business were a desire to work for myself and to have the freedom to create design led textiles and upholstery that are in keeping my own personal design style. What have been your most important experiences thus far? Patience and attention to detail have been two great learning curves for me. It takes a lot more time than I initially thought to get all the necessary information together in order to make informed decisions regarding your business and to move product development forward. It has been really worth contemplating and accounting for everything could affect the business. It has also been heartening that industry contacts that I have made over the years have been great with supporting, encouraging and helping me when I have needed to call on them for help. How has the Hatchery programme helped? The support of the Hatchery has been invaluable. One to one help has always been available regarding any aspect of the business that I am struggling with. The advice that I have received has been useful in helping me to break down the elements that I need to think about and make everything more bite size. The seminars and the mentor programme have also been immensely helpful. I would not hesitate in recommending the Hatchery programme for all of the reasons above but also for the support that you get from the other businesses that are also part of the Hatchery. It is useful to chat and share information with someone who is going through similar challenges as you. For more information on Corrine and Frame & Cover check out her twitter @frameandcove or facebook page https://www.facebook.com/pages/Frame-Cover. Frame & Cover will also be launching their website soon at www.frameandcover.com. Interested in launching a business? Check out Enterprise at London Met who host lots of events, training and start-up support for students and graduates interested in freelancing or launching their own businesses at http://www.accelerator-london.com/for-students/.